With a lot of data…comes a lot of duplicate data. Duplicates in Excel can cause a lot of troubles. Whether you import data from a database, get it from a colleague, or collate it yourself, duplicates data can always creep in. And if the data you are working with is huge, then it becomes really difficult to find and remove these duplicates in Excel. In this tutorial, I’ll show you how to find and remove duplicates in Excel. 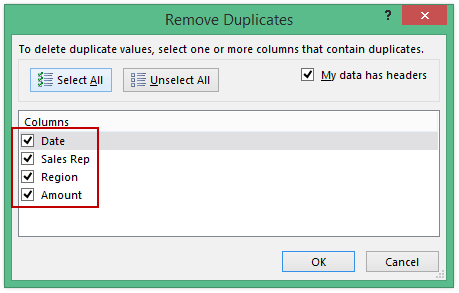 FIND and HIGHLIGHT Duplicates in Excel. Find and Highlight Duplicates in a Single Column. Find and Highlight Duplicates in Multiple Columns. Find and Highlight Duplicate Rows. 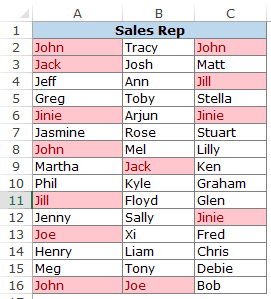 Remove Duplicates from a Single Column. Remove Duplicates from Multiple Columns. 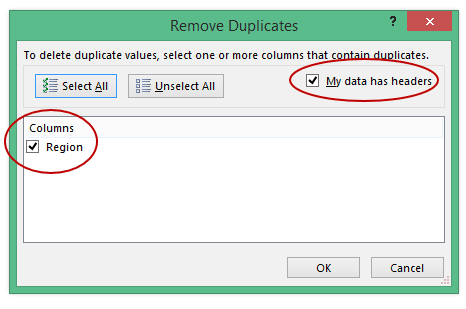 Duplicates in Excel can come in many forms. You can have it in a single column or multiple columns. There may also be a duplication of an entire row. 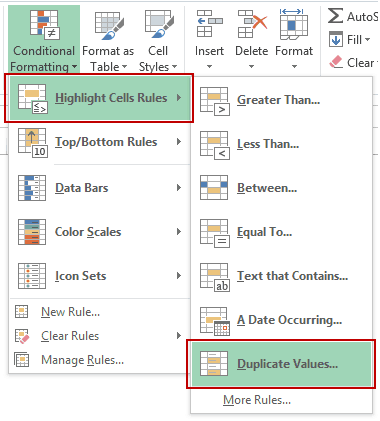 Conditional Formatting makes it simple to highlight duplicates in Excel. 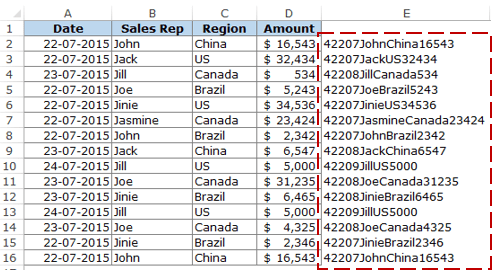 Select the data in which you want to highlight the duplicates. 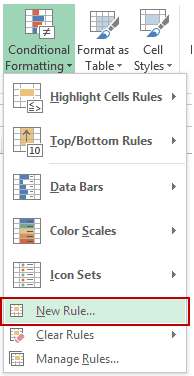 Go to Home –> Conditional Formatting –> Highlight Cell Rules –> Duplicate Values. In the Duplicate Values dialog box, select Duplicate in the drop down on the left, and specify the format in which you want to highlight the duplicate values. You can choose from the ready-made format options (in the drop down on the right), or specify your own format. This will highlight all the values that have duplicates. Quick Tip: Remember to check for leading or trailing spaces. For example, “John” and “John ” are considered different as the latter has an extra space character in it. A good idea would be to use the TRIM function to clean your data. If you have data that spans multiple columns and you need to look for duplicates in it, the process is exactly the same as above. In the Duplicate Values dialog box, select Duplicate in the drop down on the left, and specify the format in which you want to highlight the duplicate values. This will highlight all the cells that have duplicates value in the selected data set. Finding duplicate rows is a bit more complex than finding duplicate cells. By doing this, we have created a single string for each row. If there are duplicate rows in this dataset, then these strings would be exactly the same for it. Now that we have the combined strings for each row, we can use conditional formatting to highlight duplicate strings. A highlighted string implies that the row has a duplicate. Select the range that has the combined strings (E2:E16 in this example). In the Duplicate Values dialog box, make sure Duplicate is selected and then specify the color in which you want to highlight the duplicate values. This would highlight the duplicate values in column E.
In the above approach, we have highlighted only the strings that we created. But what if you want to highlight all the duplicate rows (instead of highlighting cells in one single column)? Drag this down for all the rows. This formula combines all the cell values as a single string. 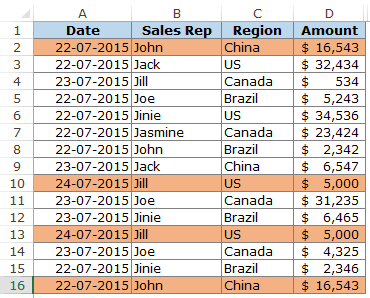 With the data selected, go to Home –> Conditional Formatting –> New Rule. 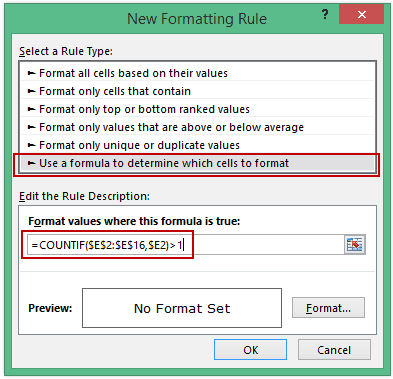 In the ‘New Formatting Rule’ dialog box, click on ‘Use a formula to determine which cells to format’. 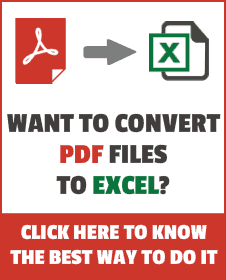 Select the format and click OK. This formula would highlight all the rows that have a duplicate. In the above section, we learned how to find and highlight duplicates in excel. In this section, I will show you how to get rid of these duplicates. 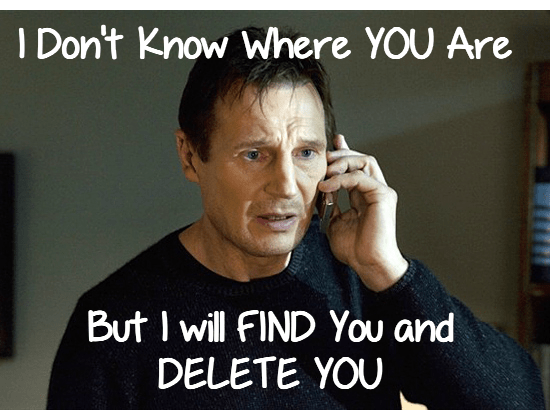 Go to Data –> Data Tools –> Remove Duplicates. If your data has headers, make sure the ‘My data has headers’ option is checked. Make sure the column is selected (in this case there is only one column). This would remove all the duplicate values from the column, and you would have only the unique values. CAUTION: This alters your data set by removing duplicates. Make sure you have a back-up of the original data set. If you want to extract the unique values at some other location, copy this dataset to that location and then use the above-mentioned steps. Alternatively, you can also use Advanced Filter to extract unique values to some other location. 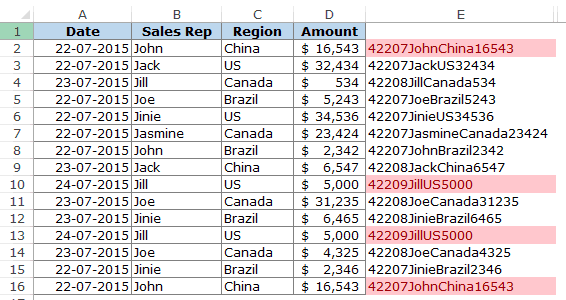 In the above data, row #2 and #16 have the exact same data for Sales Rep, Region, and Amount, but different dates (same is the case with row #10 and #13). This could be an entry error where the same entry has been recorded twice with different dates. Select all the columns except the Date column. This would remove the 2 duplicate entries. NOTE: This keeps the first occurrence and removes all the remaining duplicate occurrences. Use the above-mentioned techniques to clean your data and get rid of duplicates. 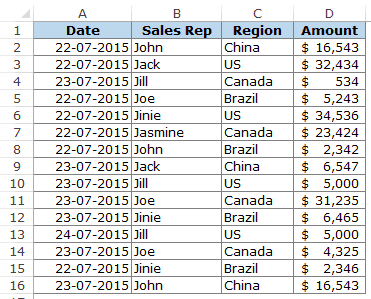 Remove Leading and Trailing Spaces in Excel. How to Find Merged Cells in Excel. I have a question that I can’t find the answer to. How do i find and delete duplicate row data in multiple column data when columns are not unique. For example I have fantasy football lineup combinations and you would have a QB RB RB WR WR WR TE DST K and I want to eliminate duplicate lineups. However, a WR could show up in any of those WR columns and you could have the same group of players show up in multiple rows depending on which column that player got entered in but its really the same lineup. Is there a way to get around this to remove duplicate rows? Nice and neatly explained. Can we find the same with the help of Vlookup or not? I have an query that if i want to know that which no. is repeated how many times then which formula should we use. Like I want to check that every duplicate value is how many times repeated. Please explain. My point is not about readability, it’s about robustness of the formula. There are rare cases that may give you wrong “duplicated rows” without the use of delimiter.